In studying the harmonium, there are many instruments which can make its way indirectly through the harmonium. First, we will examine the instrument called the tanpura. Figure S3.1 shows a tanpura used in North Indian music. A tanpura is a four-stringed drone instrument which is constantly strummed throughout a performance to keep the pitch. The tanpura is usually tuned to S, S of the mandra saptak, and P of the mandra saptak. Because of this rich sound, singers and musicians prefer this instrument for its light sound and powerful range. As said before, it is tuned to ‘P, S, S, and ‘S. This is true with most ragas. However, there will be some ragas where there won’t be a P in there, like Raga Malkauns. Since there is a suddha ma, the tanpura will be tuned to ‘m S S ‘S. If there is no Pa and no suddha ma, then the first string is tuned to ‘N, since that next best solution. 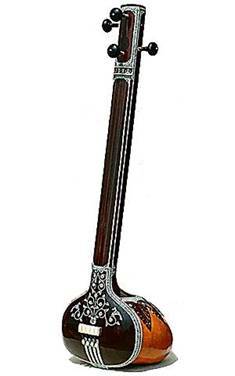 Tanpuras, however, are one of the most fragile instruments. The sound box is made of pumpkin gourd, which can break pretty easily. Also, transporting tanpuras become very difficult as they can be as tall as a person! It also requires constant maintenance and care. A couple of alternatives were developed. 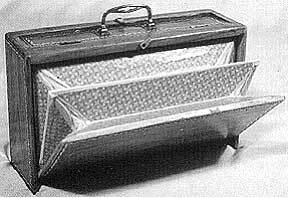 First alternative was electronic tanpuras, which were machines used to replicate the sounds of the tanpura. It is great for musicians practicing Indian music, who couldn’t afford an actual tanpura. Of course, there is no real replacement for the real tanpura. A second alternative was the sruti-peti, which is shown on Figure S3.2. A sruti-peti is a harmonium without keys. When air is pumped into it, it a drone of one key is held for a long time. Musically, this really does not have much value as Sa can change depending the main artist. As well, you only have one note to use as a drone. The harmonium can do more than what sruti-peti can do, for obvious reasons. You can use your harmonium and play Sa as well as Pa or ma together. This will be the perfect drone. If you harmonium has drone stops, pull the appropriate stop and it’ll play that note for you instead of you always having to push down on the key. When playing a melody without using stops, you can often play the Sa together certain notes to make a strong effect of the Sa’s presence. This is just a simple example of how the harmonium and tanpura work together.